Stampin Anyone? : Isn't she Lovely! I am a hippo freak! I love hippos…really don’t understand this love I have for them. I buy anything and everything when it comes to hippos…my house, my office, and my car are all full of hippos. 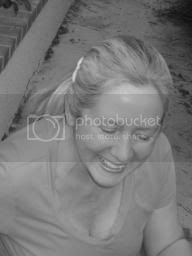 THEN, to top it off…add the color PURPLE! OMG! I have just gone to Heaven. Purple is a color that touches my heart and lets my soul sing. (Again, I really don’t understand the attraction.) I know when I see a purple hippo…it’s mine! I wanted to honor the hippos of the world and present them in Purple Majesty. Here she is in all her GRAND splendor! My BABY! I have to agree ,Kivonne. There is something totally irresistable about a purple hippo. This is a fabulous card! I love how you mixed up your stamps here. This hippo is adorable, especially because he is purple!! Thanks for your comments. Hope you and yours are doing well! 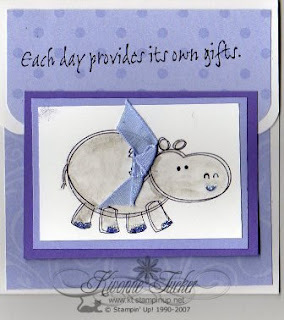 This is the cutest hippo I've seen in a while - you did a great job with it - the purple is great! I love the card as much as I loved reading about your love of hippos and purple! lol Really adorable! From your SBS sista, GinaP! Awww, your card is SO cute!